I am home for a long weekend and skied Ridge-Patterson Friday, Feb. 1. ASP was out grooming the old snow. The snow is fast and hard; tracks are shallow. The base covers the ground except for some spots in low areas in the saddle between the hairpin and the shelter, and near the Ridge-Patterson junction. There are oak and beech leaves in the tracks that made the kick wax grab unpredictably. Looking at the weather forecast, I expect this weekend to remain ski-able. I plan to switch to no-wax Saturday, both because of the leaves in the tracks, and the rising temperatures. We have had a foot of snow or thereabouts at my house, so there should be plenty of snow on the ASP trails. I am hoping for grooming, but it is Sunday, so we will see. Add a comment to this post to report what conditions you find! It is January and we have no snow as of this date. I am going to be out of town for most of the next couple of months, so if ASP gets enough snow to ski, it will be up to y’all to add a comment to this post to report on conditions. Allegany Nordic is on Facebook! 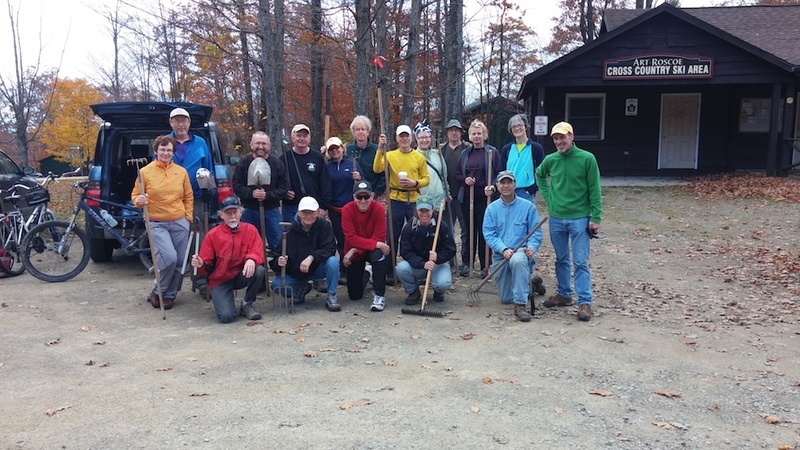 The 10/25/14 work day and pot luck was a huge success/ Crews cleaned and cut back all trails but Snow Snake. The Christian Hollow snow fence was also re-set. And the chili selection at the pot-luck was of gormet proportions! Remember to thank the gritty skiers that help keep the trails clear.